One of the most talked about subjects in the local church today is that of discipleship. Questions such as “What model should we use?” or “How do we know what a disciple looks like?” or “Doesn’t discipleship happen naturally?” are common today. Conferences are held, workshops are offered, and books have been written to meet the growing desire of churches to be effectively engaged in the discipleship process. 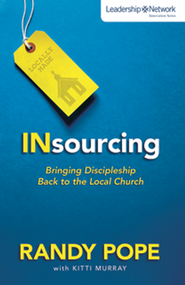 In his new book “Insourcing; Bringing Discipleship Back to the Local Church”, Randy Pope, lead pastor of Perimeter Church in Atlanta, Georgia lends his thoughts and convictions to this ongoing conversation. In his LOLMD model, there are five main emphases that Pope gives to the reader. They follow the acronym TEAMS. Truth: Members of the small group learn how to study the Bible on their own and bring questions back to the entire group. Equipping: Members are given specific plans to follow which are modeled before them in group with assignments given for follow-up. Accountability: Hard questions are asked of the members and behavior is challenged in a grace-filled environment. Mission: Members are challenged to take the mission of Christ into their homes and workplace. Supplication: An atmosphere of prayer is always present among the members of the group. Scattered throughout the chapters is a mock small group meeting. Pope uses these fictional characters to illustrate how the model is fleshed out in men’s and women’s groups. All in all, Pope has written a good book that lends an interesting twist to the discipleship conversation. “Insourcing” is well-written and informative. However, there is nothing ground-breaking here. Leaders who have been following the ever-changing pursuit of discipleship through courses, conferences, and books will recognize the content here. Next ›And The Winner Is…. BTW-I have numerous book giveaways going on at my site if you want to stop over and take a look. Also, I am hosting a “Best of Books” BlogHop if you’d like to check that out and sign up.